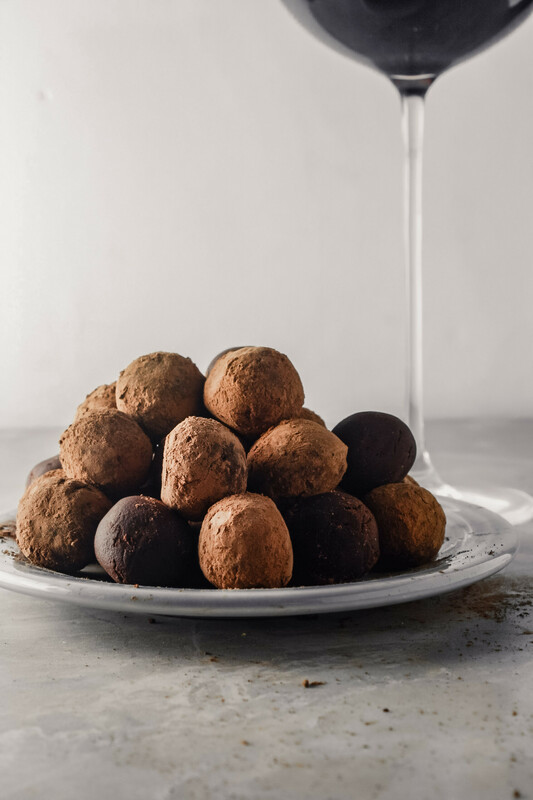 This recipe for red wine dark chocolate truffles is somewhat standard, using heavy cream and a touch of butter to create that signature silkiness truffles are known for. 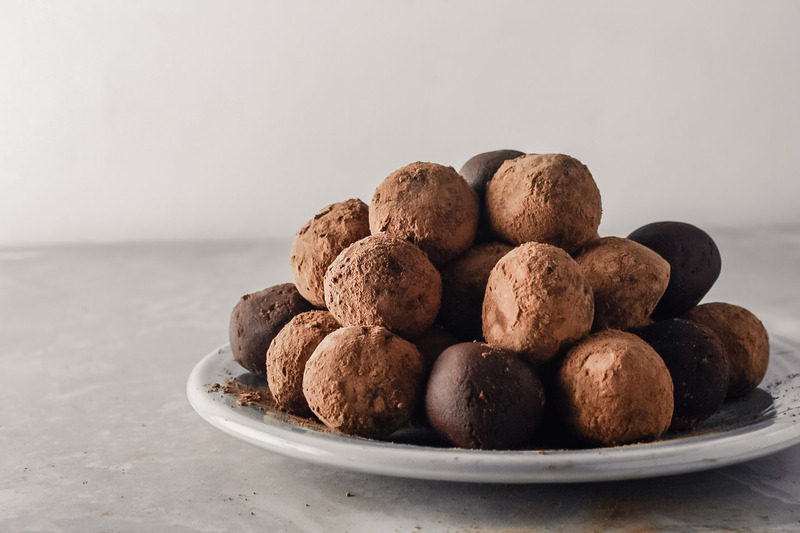 But it’s the red wine that makes these dark chocolate truffles stand out from all the rest. Dry red wine is reduced and combined with cream, butter and vanilla to create a chocolate treat that’s dimensional and delicious. These are the definition of celebratory. 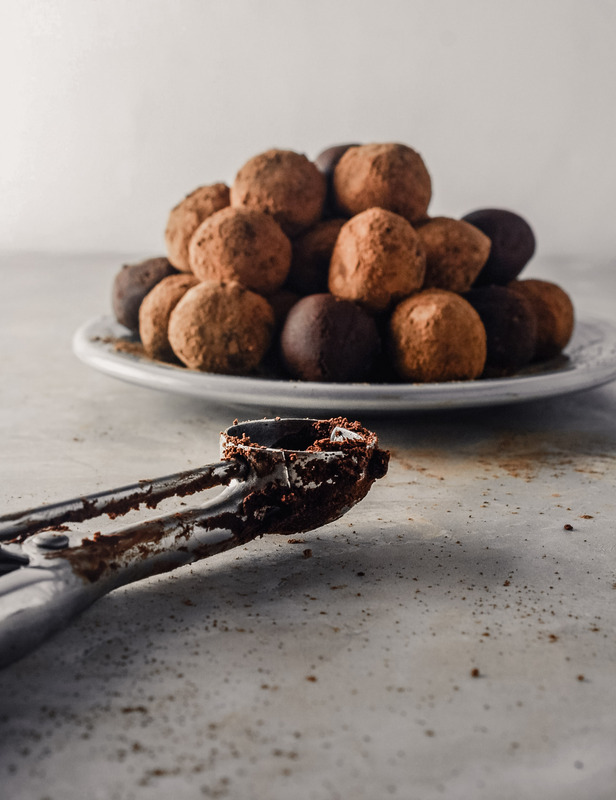 For classic truffles I opt for the classic cocoa coating. I prefer to steer clear of coatings that add texture and crunch, which tend to be distracting and take away from the integrity of the creamy chocolate itself. Sticking to the traditional cocoa powder keeps things simple and elegant. However, toasted and finely chopped nuts, flavored sugars, and shredded coconut are great coatings to use if you want some contrasting crunch. Bring wine to a boil in a small saucepan, reduce heat to medium-low and simmer until reduced to ¼ cup, 9-10 minutes. Add cream, butter, vanilla, and salt to simmering wine, cook until butter has melted and bubbles start to form around the edges of the pan, about 2 minutes. Pour wine-milk mixture over chocolate, cover with plastic wrap and let sit 5 minutes. Gently stir ganache until smooth and completely incorporated. Transfer ganache to an 8-inch square baking dish and spread into an even layer. Let sit at room temperature for 1 hour, then cover and refrigerate until firm and scoopable, about 1 hour. Roll truffles in cocoa then transfer to an airtight container and store in refrigerator. Bring to room temperature before enjoying.